Ollie Pearce admitted his decision to leave Bognor for Worthing was hard – but said he was leaving on good terms. After weeks of speculation that his Nyewood Lane career was over, Pearce confirmed on Tuesday he was making a fresh start alongside another former Rocks favourite James Crane at Woodside Road. The pair will be part of a Worthing squad who will face the Rocks in the new Bostik premier season. His departure intensifies the Rocks’ hunt for new strike power and they will return for pre-season training next Monday still with work to do to complete a squad capable of doing well in the campaign to come. Worthing have had to pay the Rocks a fee for 22-year-old and Bognor bosses and fans have wished him well after seven years at the Lane which brought 82 goals in close to 300 appearances, including some vital ones in the FA Trophy run of 2015-16 and the Ryman premier promotion campaign a year later. Pearce told the Bognor Observer: “It was a hard decision, of course, especially going to Worthing, because of the rivalry. But at the end of the day it’s non-league football, we don’t have the luxury of moving house to move football clubs! I made my mind up as the season came to a close. I felt for myself I needed a new challenge, and that’s really the main reason. I was unhappy with how things went last season but there was no bad terms, I believe I left on good terms. “I made my mind up as the season came to a close. I felt for myself I needed a new challenge, and that’s really the main reason. I was unhappy with how things went last season but there was no bad terms, I believe I left on good terms. “Jack (Pearce) wanted to speak and meet me, but I had already made my mind up. I was on the phone to him for a good 45 minutes one night and it wasn’t a nasty conversation – it was all very honest and Jack wanted me to stay. “In terms of past coaches and managers, Dabba (Darin Killpartrick) is the main one I’d like to thank. Jack and Jamie (Howell) were brilliant to me and for me, but really if it wasn’t for Dabba I probably wouldn’t have played there. He definitely helped my development, especially through college football. The Observer first revealed a fortnight ago Pearce was likely to leave. The Rocks have re-signed many of last season’s squad but have added only one new face so far this summer – former Worthing left-sided utility player Harvey Sparks. They are on the lookout for new players and finding at least one new striker is key to make sure last season’s goal drought is not repeated. Striker Jimmy Muitt indicated last week he was staying at Bognor. There is still no word on whether keeper Dan Lincoln will stay with the Rocks – and the club are exploring possible loanee keepers with more than one Football League club. Manager Jack Pearce said: “Ollie wanted to leave last season and take on what he described as a new challenge. But I convinced him to stay and he did so. This time around he has made his mind up to leave after seven years with us, and we can only respect his wishes. “Ollie made his debut for us at 17, and made something like 270 appearances, scoring more than 80 goals. We wish Ollie all the best as he pursues his new challenge. 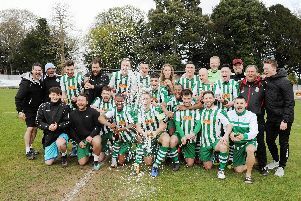 “Our challenge, of course, is to sign players who do want to play for Bognor Regis Town and there is a confident mood in our camp that we can do that. The Rocks will train three times a week, with new coach Robbie Blake taking charge, with pre-season friendlies due to start on Tuesday, July 17, when Brighton under-23s visit Nyewood Lane.